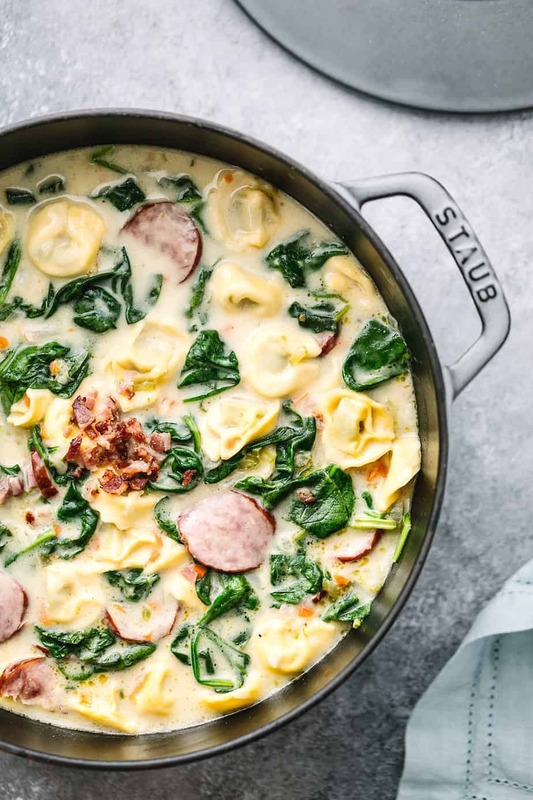 If you are looking for creamy pasta soup, try this Creamy Tortellini Soup with Kielbasa and Spinach recipe. 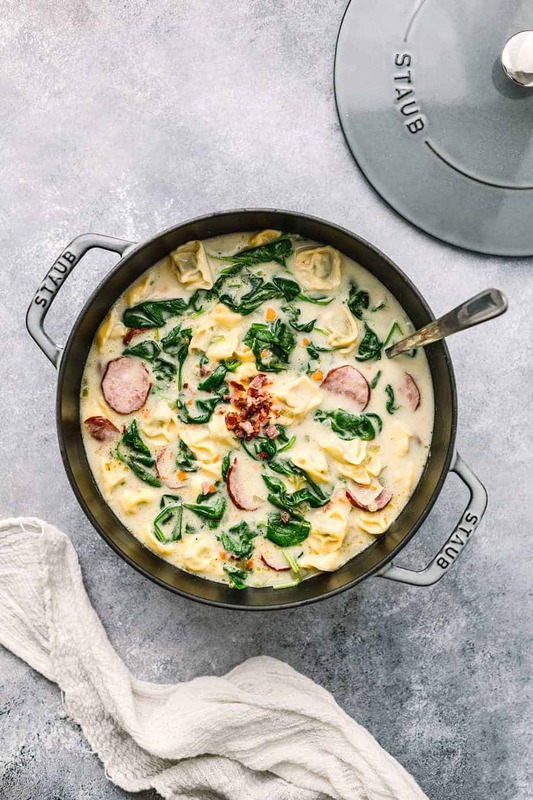 A quick hearty soup recipe that’s ready in less than 30 minutes made of Tortellini pasta, Kielbasa, Spinach, Mirepoix (an Onion, Carrot, and Celery mixture), low sodium broth and heavy cream. To make this delicious creamy tortellini soup recipe, I used one of my favorite ingredients for all of my soups and stews, Mirepoix. Mirepoix is a combination of aromatic vegetables for soups, stews and braises that consists of chopped onions, celery, and carrots. I prefer to chop the Mirepoix ingredients into finer pieces and cook them in the dutch oven with a small amount of olive oil or butter. In this more tender state they can more effectively infuse the foods and flavors. I also added Kiełbasa, a type of sausage originating across modern-day Poland and Ukraine. You can find Kielbasa sausages at any grocery stores. I purchased a 4-pound bag of Kielbasa sausages with no nitrates at added at Costco for around $10. This creamy tortellini soup would make the perfect warm and filling dinner for the whole family. Because some of tortellini pastas filling and Kielbasa sausage you select the recipe may contain higher levels of sodium. On that note be sure to use low sodium chicken broth, and add some water if needed to balance out the flavor. Add salt and pepper at the very end of cooking and only if you feel it’s really needed. 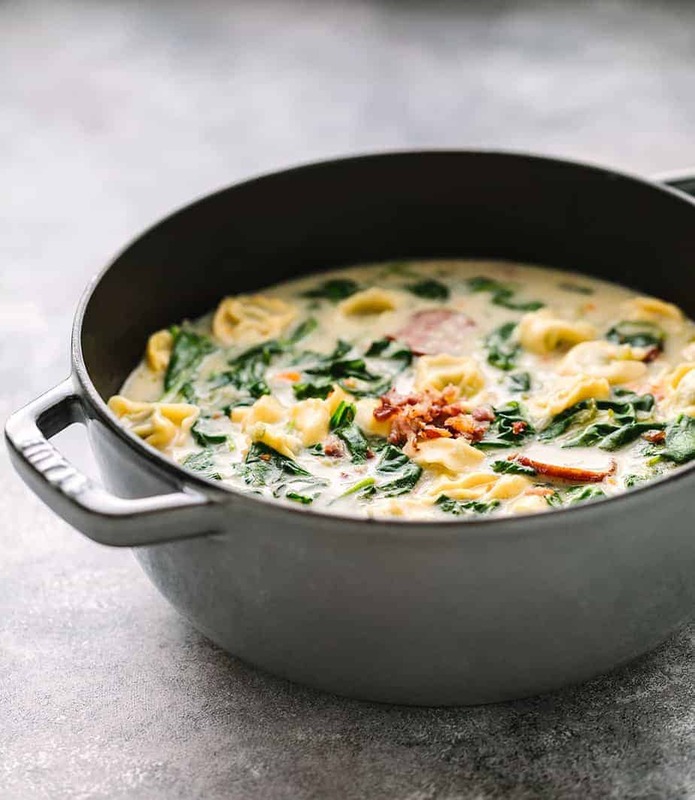 I only added 1/2 cup heavy cream into this creamy tortellini soup because thick soups, especially those made with starchy vegetables or pasta, may continue to thicken during cooking, storage and reheating. Bsure to stir the soup from time to time throughout cooking process, to prevent starchy ingredients from sticking to the bottom of the pot and for the best flavor, texture and appearance. Melt butter in a large dutch oven or skillet over medium heat. Add Mirepoix ingredients: onion, carrots, celery, garlic and cook until tender (for about 5 minutes). Add flour and cook for about 3 minutes, stirring occasionally. Add low sodium chicken broth into the mirepoix and flour mixture, stir until well blended. Pour in heavy cream and Kielbasa Sausage into the pot and bring the soup to simmer for about 5 minutes. Stir in tortellini pasta, cover and cook until the pasta is tender or according to the product packaging. Once the pasta is fully cooked add fresh spinach and stir for about 1 minute. Season with salt/pepper or add more low sodium chicken broth, heavy creamy or water if needed. Remove from the heat and serve. Tortellini are ring-shaped pasta, you can find them at any grocery market and usually come in different filling options, such as cheese, spinach, lobster, butternut squash, etc. For this recipe, I used Tortellini spinach. You may substitute an equal amount of heavy cream for half-and-half cream. Heavy creams contain more fat than half-and-half-creams and also more resistant to curdling, so they are a better choice in soups and sauces. Pinning! All of my favorite flavors and so easy to make too! Sounds wonderful and so perfect for this time of year. This is my kind of comfort soup! Looks so appetizing and easy to make! Saving it for later. Yum, this is full of things I love! Pinning this for later. This looks lovely and I’m crazy about the addition of kielbasa! On a separate note, where did you get your photo background?